Well, it appears to be rather little. Despite some 12 months of consultation across a number of options what we’ve been left with is something of a disappointment in the brave new world of urban design. Looking at some international examples, the intent seems clear enough: reinvent what was a fairly busy inner-city street to become a shared space much better suited to the current mix of cars, pedestrians cyclists. This concept is not new – particularly in the Netherlands where this approach has been well implemented. 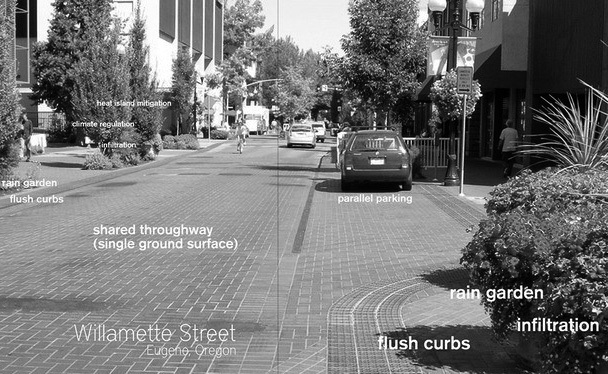 The image below shows the concept and, on the surface, it’s not dissimilar to the intent of the Bunda Street project. In the European model, the philosophy involves removing as much of conventional visual signals that tell users where they should be and how they should behave. By stripping the streetscape of traffic signs, lane markings and parking bays, users are forced to consider the space and follow logical behaviour patterns: cars drive more slowly, cyclists stick to the fringes of the roads and pedestrians are forced to concentrate on the vehicles moving through the space before crossing the street. The result has been a reduction in traffic accidents between all three types of users. We got close – but not quite there. 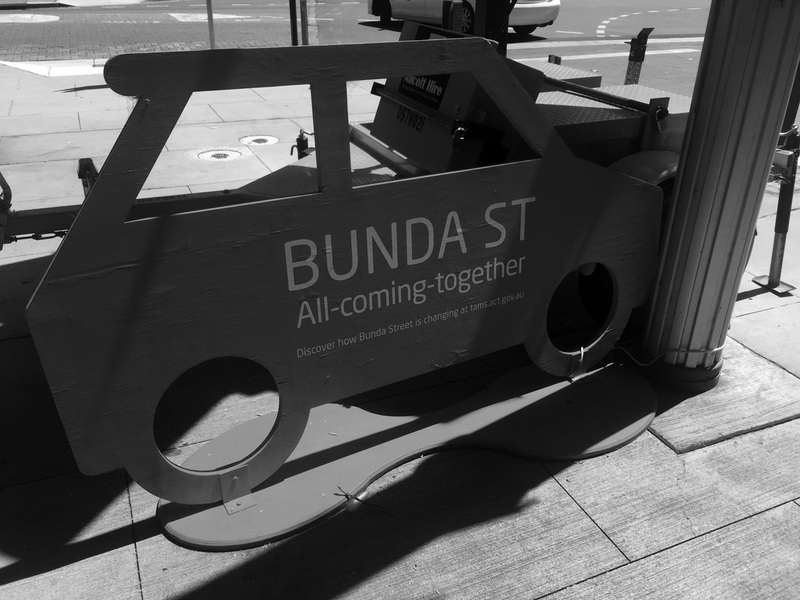 An extra step on Bunda would have been to remove all street-side parking except for a couple of disabled car spaces to ensure adequate access for the infirmed. Perfect. The current result merely sees a few planter boxes placed strategically throughout the length of Bunda Street while raising street level a couple of inches to remove the concrete gutter. The irony of all this is that through the sheer silliness of zebra crossings linking the segmented body of Canberra Centre, we pretty much worked it all out for ourselves. Repeatedly throughout peak pedestrian periods shoppers halt on either side of the crossings to allow hapless drivers to make their way through lest they starve to death waiting for an actual gap in the stream of pedestrians. The law says they don’t have to stop and wait, that pedestrians have right of way through the crossing. However they still do, because most people know how to function as sentient and somewhat civilised beings. Take away the paternalism of lanes and street signage and we think it would have all worked out quite nicely. 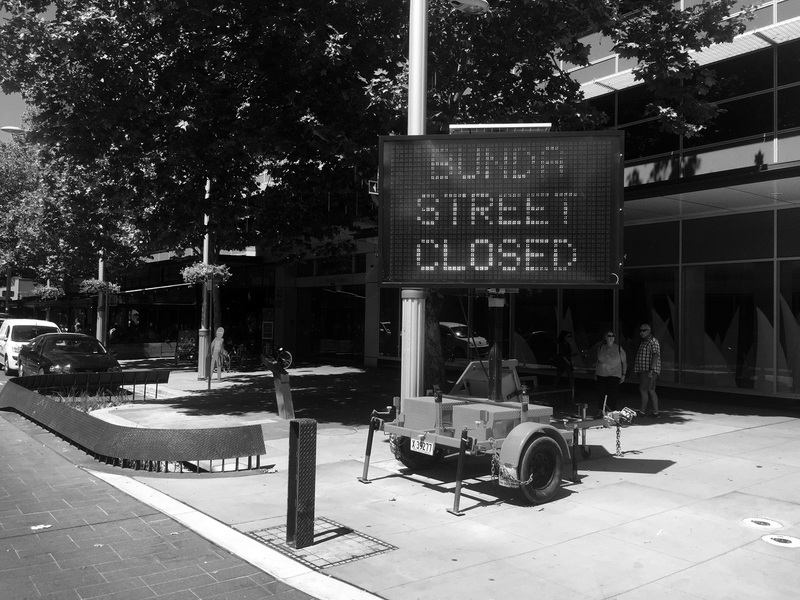 Had Bunda Street had taken a ‘less is more’ approach the outcome might have been equally as sensible. That really is a pity. I remember looking at the initial designs with fondness as I thought it was such a fantastic idea. But as you say… consultations. Design by committee also works in favour of the committee and not the design. oh god, amen. i’ve been thinking this for weeks. what sort of madness was this?! Yep. The whole redesign of civic is clearly lacking some design principles which could have easily been derived from overseas experiences. 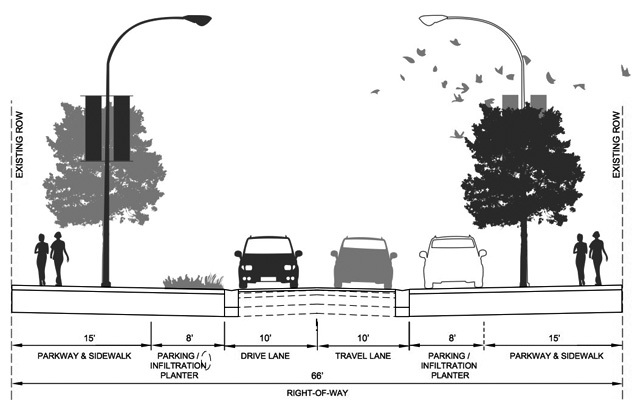 This includes the new bike lanes in west civic which take up space and are not really used and their integration with pedestrians. I support the initiative – but my taxes are being wasted on poor implementations.